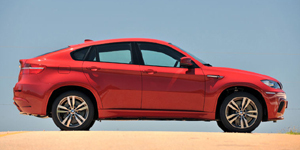 For 2010, the performance-oriented BMW X6 M joins the lineup. In addition, a power tailgate and HD radio are now standard, while automatic high beam headlights are offered as a stand-alone option. The rear-view camera adds a Top View feature and X6s with iDrive get the fourth generation of the system, which includes an 8.8-inch screen and an 80-gigabyte hard-drive to hold navigation information and music.